Don’t throw your vote away. Many people say that when you vote for a 3rd party, you are throwing your vote away. But, it can also be argued, that when you vote for someone you don’t really believe in, you’re throwing your vote away. In other words, voting for the lesser evil, is still a vote against your own interests. When an election has a low turnout, people sometimes imply that voters are making a statement, by not voting. But, that’s exactly what big business wants. Polls show, that the more people vote, the more progressive the outcome. So, when people don’t vote, they’re unwittingly yielding to corporate interests. If you vote for the lesser evil, or decline your vote, you are actually being manipulated by the 1%. One way of looking at it, is that the only way to completely throw your vote away, is to not vote. Just think, if everyone who didn’t vote in 2000 (because they were fed up with the two party system), voted for Ralph Nader of the Green Party. What would've happened? Bush still would’ve won, but the Green Party would be a viable party today. We would have a three party system by now, and that would be a major accomplishment! That would be a far greater accomplishment, than electing the Wall Street Corporate Drone Captain/Deporter in Chief, Barack Obama. Both corporate parties keep moving to the right. So, we have to draw the line somewhere. 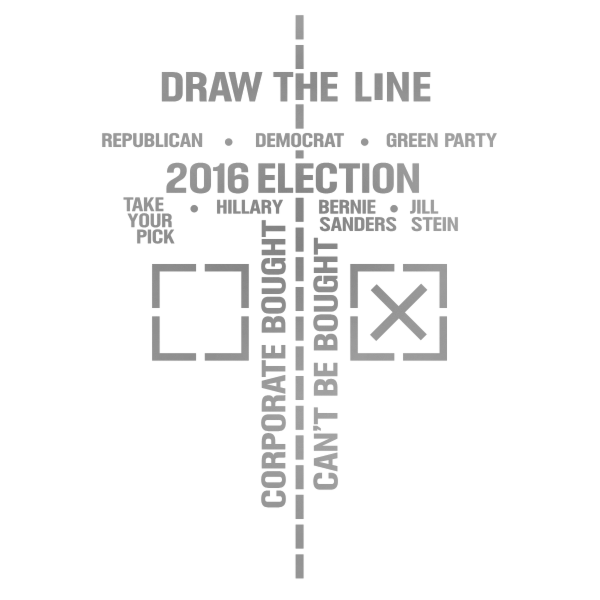 We can draw the line between elected officials who represent private corporations, and our public representatives who actually represent the public. Bernie Sanders & Jill Stein are not afraid to stand up to big multinational corporations and hold them accountable, in favor of human rights. Both, Bernie Sanders and Jill Stein have demonstrated that they can't be bought, and will not be bought by corporate interests. Hillary & the Republicans are already corporate bought! That’s why it’s imperative that Democrats vote for Bernie Sanders in the Primaries. Let the Democrats in Washington know, early on, that there will be no vote (for Hillary) for corporate interests in 2016. The Choice will be between Bernie Sanders of the Democrats or Jill Stein of the Green Party.